Despite Christmas Day being only six weeks away, more than three quarters of Cardiff residents still don’t know how they plan on spending the day, as a new survey reveals that over a third of us feel anxious and worry about making plans for the festive period. Contact the Elderly, the only national charity to tackle isolation and loneliness through face to face contact, commissioned the research to highlight the impact of societal pressures on families over Christmas and the impact it can have on older people left to spend Christmas alone. According to the charity, 22% of Cardiff residents worry about upsetting family members when making Christmas plans despite the fact that almost 53% make the same festive plans every year. The research also found that only 20% of people in Cardiff have totally confirmed their Christmas plans for this year’s festivities. For two thirds of Cardiff residents, those plans normally involve staying at home and over a third of all respondents say that Christmas regularly involves visiting older relatives. Almost 4% of those surveyed admit to spending Christmas holidaying within the UK yet only 1.3% of Cardiff respondents spend the day volunteering or helping out in the local community. The charity released the festive research to coincide with the news that they’ve joined forces with Community Christmas, an organisation which aims to ensure no older person spends Christmas Day alone if they don’t want to. The Community Christmas website lists events taking place across Cardiff that are open to older, vulnerable people in the community who would otherwise be spending Christmas Day alone. No two events are the same and they vary from community Christmas lunches to formal sit-down dinners in community centres like Maes-y-Coed Community Centre and St. Fagans Community Hall in Aberdare. South Wales residents can also attend events at the Ponty Elim Church in Pontypridd and Bethel Baptist Church Hall in Llantwit Major. Any event which creates the all-important connections that hold communities together can be a Community Christmas event. Community Christmas is becoming part of Contact the Elderly at a time when event listings on the site are expected to hit an all-time high. When the site was established in 2011 by community transport volunteer Caroline Billington there were just four events listed. The following year this number grew to 74, and in 2017 Community Christmas passed the 500-mark following support from, amongst others, the Big Lottery Fund, Waitrose, and the Jo Cox Foundation. “Everyone recognises that Christmas can be a difficult time of year, particularly for people who are isolated or vulnerable. Caroline made it her mission to ensure that anyone who doesn’t want to spend Christmas Day alone doesn’t have to. As an organisation, it is the perfect fit for Contact the Elderly which has been fighting isolation and loneliness among older people for over 50 years through volunteer-led social gatherings. Contact the Elderly is renowned for its tea parties which have now helped over 100,000 people since the charity launched in 1965. 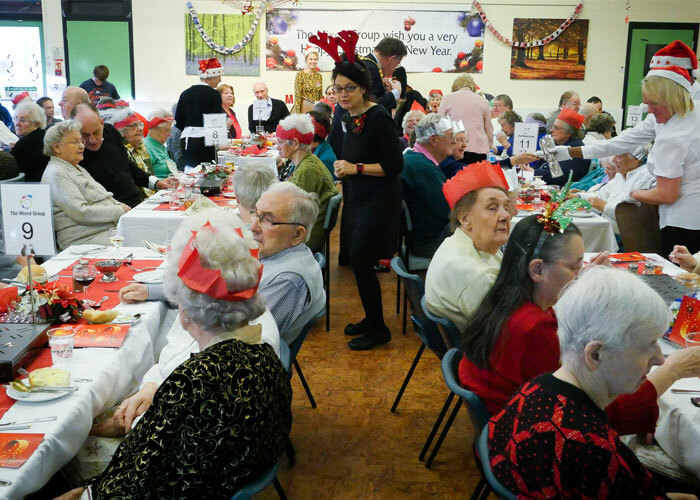 The older people’s charity is currently supported by nearly 12,000 volunteers including tea party hosts and volunteer drivers to take guests to and from the parties. “I volunteered on Christmas Day almost ten years ago and it changed my life. I knew then that I wanted to focus my time and energy on creating something that would benefit older people for years to come.